Of all the advances made in videogames over the last thirty years, perhaps the one that’s least heralded is the advancement in quality of voice acting. Thirty years ago, I was playing some budget five-a-side football game on my trusty ZX Spectrum 48K, and was amazed to hear a fizzy digitised sample of a David Coleman sound-a-like proclaiming “GOAL!”. Ten years after that, the technology for delivering voiced lines had advanced with the advent of CD-ROM games, although the acting left much to be desired. Resident Evil is still the standard bearer for ‘so bad it’s good’ acting, but it’s by no means an outlier in ‘90s titles. Now here we are in 2016, and if anything we take quality voice acting for granted, such are the standards set by the likes of Baker, Hale and North in recent years. Read more: if you prefer to provide the dialogue yourself, try our favourite co-op games. So, it’s safe to say that the recent decision by actors’ union SAG-AFTRA (one that counts a number of videogame voice actors amongst its membership) to strike over pay conditions is a pretty big deal for all concerned. I don’t intend to speak to the ins-and-outs of it from the point of view of the game devs, the publishers or the actors themselves – I still struggle with the nuances involved in tying my shoelaces, never mind the intricacies of an issue as complex as this one. Instead, I’ll focus on the games themselves, because an elongated strike is almost certain to affect any game currently in or just about to enter development. In such a scenario, what are the options? Well, they may seek to bring in some non-unionised voice actors and, well, I’d be lying if I said I wouldn’t enjoy a wee spell of 1996-quality voice acting in my games again. However, it might also mean a spell of games with no voice acting at all. The question then becomes: what would those games look like, and more importantly, sound like? Well, thankfully, there have been some brilliant examples in recent years of games that chose to eschew spoken dialogue altogether whilst still maintaining a strong narrative element. Could the games below serve as shining examples of the way forward in a worst case scenario? 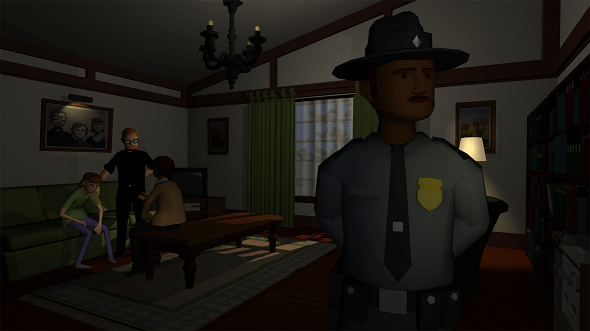 One of the common issues with mystery adventure games is that they often drown in exposition, and voice acting is the crutch that allows them to do so, robbing them of that mystery with line after line of dialogue. By doing away with voice acting and dialogue altogether, Variable Games produced a taut thriller with barely an ounce of fat on it, as the story is told almost exclusively through what you can see, rather than what you can hear (although it has a truly excellent soundtrack). Every facial tick and physical interaction matters, in a way that focuses your attention much more than an overlong soliloquy does. It’s a masterclass in both pacing and storytelling. One thing you’ll notice about most of the games on this list is that simplicity is the key. Perhaps no game better illustrates that than Reigns. 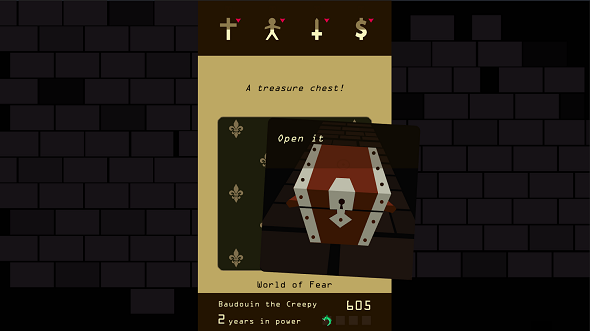 A card-based “choose your own adventure” game, designed around the constraints of mobile (although it is available on PC, so it counts. Yes it does), Reigns goes old-school and paints its world with nothing but simple geometric shapes and text descriptions. Furthermore, to ensure that the game moves at a fair pace, those text descriptions are short and to the point. Add to that a simple “one or the other” decision mechanic that sits at the core of the game, and Reigns creates a vivid world where the stakes are much higher than you might anticipate. This one shouldn’t come as a surprise to most, as – by its very nature – horror is often the easiest emotion to invoke without need of the spoken word. However, whilst most horror games tend to go for elaborate settings or Lovecraftian creatures to generate a sense of dread and fear, Slender succeeds as a result of its minimalism. It’s you, a torch, a wooded area, eight pieces of paper and a single creature. That was all it needed though, thanks to its often subtle but always effective use of audio, in the sound of broken twigs under foot or that ever-building wall of white noise. In fact, it’s noticeable that the reaction to its official sequel, The Arrival – with its audio logs, additional characters and wider range of locales – was far more muted, suggesting that “more” shouldn’t always be considered “better”. Serving as a spiritual successor to Journey, arguably the most successful title in Sony’s indie push on PS3, Abzu adopts many of the original’s core aspects – zen-like flow and a feeling of solitude – whilst delivering a very different experience. 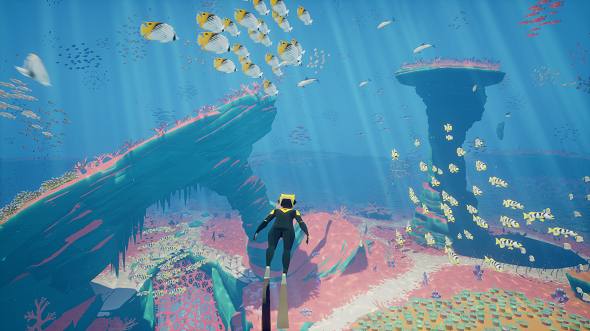 Games like Virginia deliver a defined experience in a defined environment, but Abzu – like Journey – presents something much more loosely defined and asks you to tell your own story. It doesn’t hurt that Abzu’s environment is absolutely gorgeous, full of vibrancy and colour. And when a world is as beautiful as Abzu’s, it’s that much easier to get lost in the mythology that exists within it. Of course, not every world in fiction is full of joy and colour. In fact, some strike so terrifyingly close to home that no words are needed to set the scene any further. Such is the case with Papers, Please. Like Reigns, much of the narrative is told through its simple aesthetic and the written word. However, whereas Reigns adopts a somewhat whimsical tone, Papers, Please deals in unremitting despair. 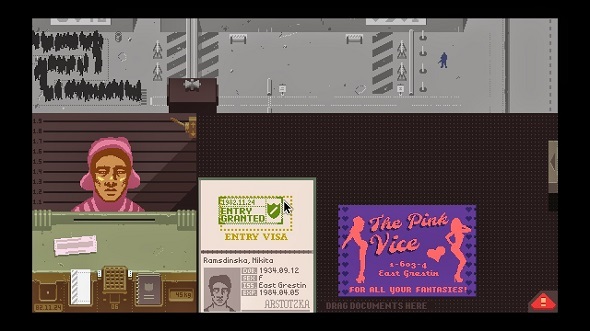 From its dour Eastern European title music to its muted tones and incomprehensible tannoy announcements, the oppression extends to every part of the game, and you quickly begin to feel sorry for many of those seeking to cross the border, as you piece together their backstories through forged documents, newspaper reports and reading between the lines. Inside, PlayDead’s follow-up to Limbo, very nearly made this list on account of having a more definable story than its predecessor. 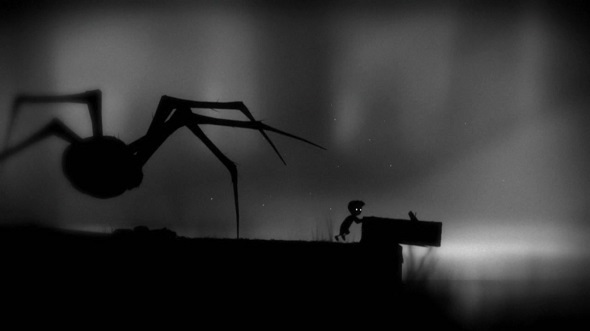 However, if we’re talking games that tell their story almost entirely through their aesthetic, then very little comes close to Limbo. 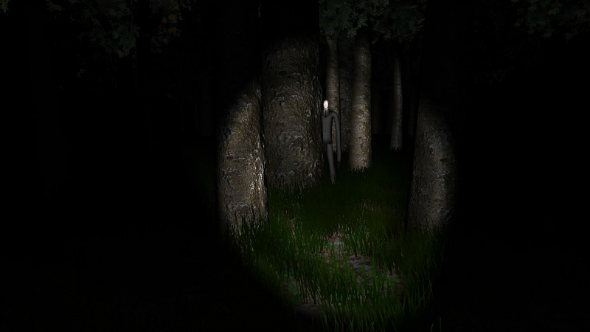 Slender lives and dies on its minimalism. Limbo dies on it. And dies. And dies. 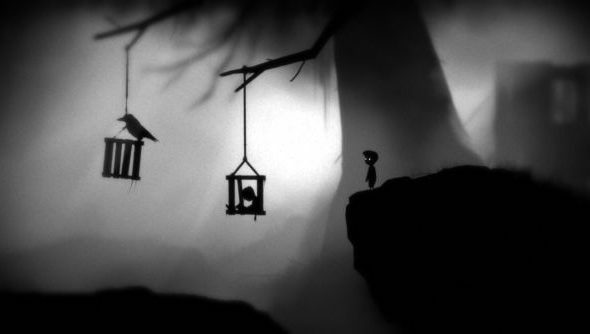 Rendered entirely in smoky monochrome, Limbo’s world establishes its motif, if not necessarily its overarching story, in double-quick time – that little boy is fragile, he’s going to die, and he’s going to die in some horrifically gruesome ways. That first death, no matter how it arrives, is shockingly vivid, and immediately ratchets up the tension. If anything, the lack of exclamation from the boy as he dies adds an extra layer of eeriness to the whole thing. 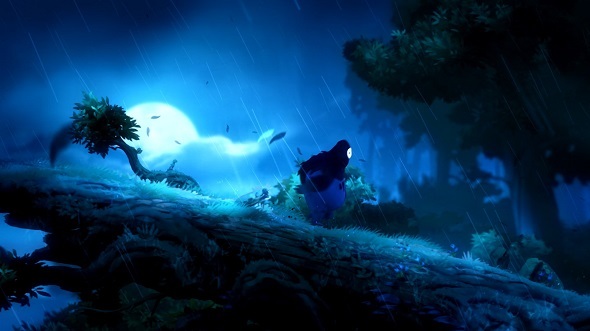 Moon Studios’ debut can be pretty easily dismissed as a brutally difficult Metroidvania-style platformer, but doing so would unfairly look past a simply told, emotionally engaging story. That this story is told as effectively as it is, without a single word being spoken, is a credit to the character design above all else. Within the first 60 seconds, you have a real feel for the relationship between Ori and his mother figure, Naru. Not many games can claim to establish that kind of connection between characters at all, let alone in such a short space of time and without using dialogue. That connection is what drives you through the game, and that connection is what makes the ending so satisfying, perfectly bookending a game with surprising heart.